This past holiday season, Kimco’s shopping centers got into the festive spirit by hosting events throughout the U.S. From annual ice carvings to meet-and-greets with Santa Claus to carriage rides, let’s take a look back at some of the recent activities. To kick off Kimco’s events, Santee Trolley Square hosted its annual tree lighting celebration on November 16. Members of the Santee community joined in the holiday spirit by singing with carolers, writing letters to Santa Claus, decorating cookies, enjoying horse-drawn carriage rides, and viewing the holiday light celebration. Over at Whittwood Town Center, the Jolly Holidays Tree Lighting Celebration took place on November 24. The Mayor of Whittier Joe Vinatieri attended and spoke along with a few other City Council members. Rancho-Starbuck Middle School Orchestra played for the crowd during the tree lighting. Some of the other activities held at the center included selfies with Santa and Mrs. Claus, face painting, balloon twisters, and music. The Jolly Holidays events at Whittwood Town Center happened every Saturday and Sunday until December 23. Christown Spectrum held its second annual Christown Cringle Workshop, which started on December 1 and ran through the 16 every Saturday and Sunday. The hands-on holiday workshop was fun for the whole family. Highlights from the weekend events included Santa’s elves working on holiday projects, ornament decorating, letters to Santa, holiday stories read by Santa’s elves, caricaturist drawings, holiday movies, and appearances from various holiday characters. This year’s events offered many prizes up to $500 in value and the first 200 guests to visit Santa’s Workshop on opening day received $5 Harkins gift cards. Christown Spectrum also supports Christown Cares, a program that gives back to the community. During the Christown Cringle Workshop, community members were encouraged to bring a can of food to place on Santa’s Workshop shelf or a toy to help fill his sleigh. All donations made were given to St. Mary’s Food Bank and the Salvation Army Angel Wish Tree. Santa’s Arrival at Suburban Square was a complete success on December 1. Over 1,000 community members came to visit Santa and Mrs. Claus and got their photo taken in the beautifully decorated courtyard. Lower Merion High School’s Jazz Band performed while carriage rides paraded through the Square. Aside from the meet-and-greet with Santa and Mrs. Claus and photos, Suburban Square gave out 500 totes and provided crafts for kids. Miss Candy Cane, a festive elf, and a magician were also in attendance to greet guests and to keep warm, guests were offered complimentary coffee and hot cocoa. 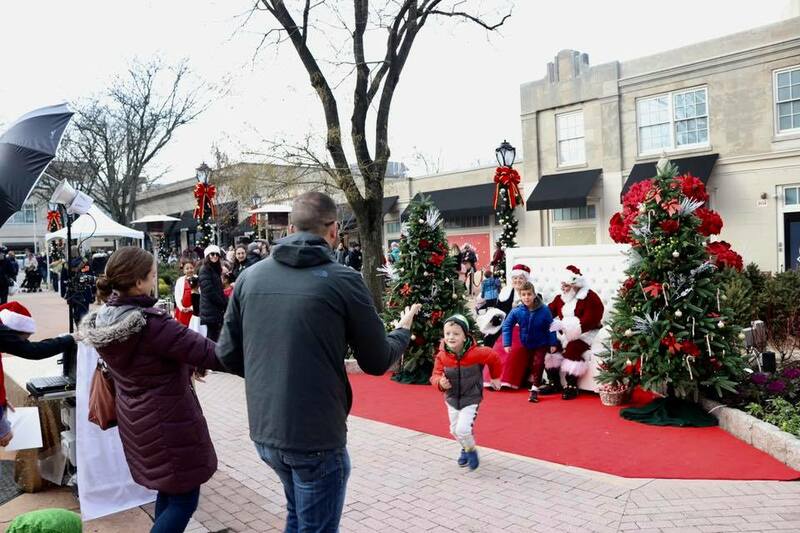 On December 22, Suburban Square hosted its “Santa and Mrs. Claus Stroll the Square” event. During this festive day, Santa and Mrs. Claus ventured out to visit Suburban Square’s shops to greet last-minute Christmas shoppers and guests grabbing a bite to eat. To add to the festive decor, Suburban Square created a specially reserved parking space for Santa in its new parking garage. On December 2, SoDo Shopping Center hosted its third annual Light Up SoDo!, a holiday fun-filled event with a tree lighting, face painting, letters to Santa, stilt walkers, train rides, princesses, bounce houses, ornament and wreath making, a balloon artist, and, of course, a visit from Santa and Mrs. Claus. At the event, there were more than 30 community volunteers who helped keep the event running smoothly. In total, there were about 14,000 event attendees, a huge success for SoDo Shopping Center and the community! Mesa Riverview hosted Super Snowy Saturday on December 8. A well-attended event filled with music, games, carriage rides with Santa, visits from Frosty & Friends, face painters, balloon artists, and tons of real snow to get in the spirit of the season. In the spirit of gift giving, the first 250 kids at the event each received $5 Cinemark gift cards. On December 14, Wexford Plaza hosted its annual Ice Carving Festival, a tradition that has been held at the plaza for over a quarter of a century and brings the community together to celebrate the holiday season year after year. This past year, nine ice carvers participated in the competition, which required them to carve a 300-pound slab of ice in two hours. The carvers were judged on the following categories: First Impression, Utilization of Ice, Finished Appearance, Proportion/Symmetry, and Creativity. Gregory Essopos, Property Manager at Kimco Realty, and two tenant representatives were the judges. Guests and tenants also had the opportunity to vote for a people’s choice award. Aside from the ice carving competition, the festival included photos with Santa, carolers spreading holiday cheer, and prizes from a local radio station including $100 to one lucky winner. A craft table, yummy treats and drinks, and a balloon artist, as well as a fake tattoo artist, were a hit among community members and visitors alike. From all of us at Kimco to you, we hope you had a wonderful holiday season and have a wonderful 2019!